Happy New Year, one and all – I hope the start of 2015 sees you refreshed and raring to go, and not too sick of kale smoothies just yet. I FINALLY managed to finish off decorating my bedroom before the big day, so I’ll post up pics of that next week, but for now I’m just stopping in with a little new-goodies update. Like most of the population, I’m currently on a bit of a health kick to get over the excesses of Christmas, and as such – along with the obligatory kale smoothies – I’m trying to generally eat a healthier diet, cutting out processed foods and (as much as possible) sugar. I like to think of it as the 1940’s Housewife Diet and have actually been enjoying blitzing up my own soups, sauces and smoothies, rather than eating all the E-numbers and gunk that are in the packets and tins. 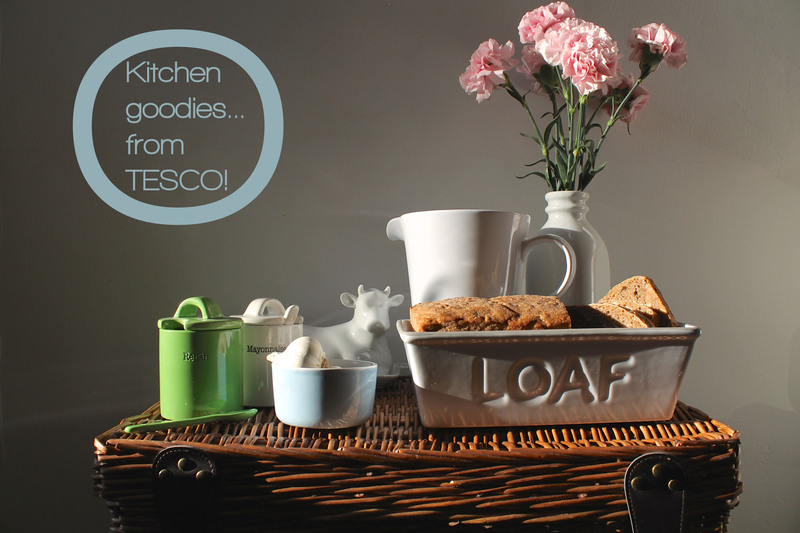 So when Tesco Direct got in touch to see if I’d like to try out a few pieces from their recently launched Autumn/Winter 2014 ranges, it was a great opportunity to add to my ever-growing kitchen kit! 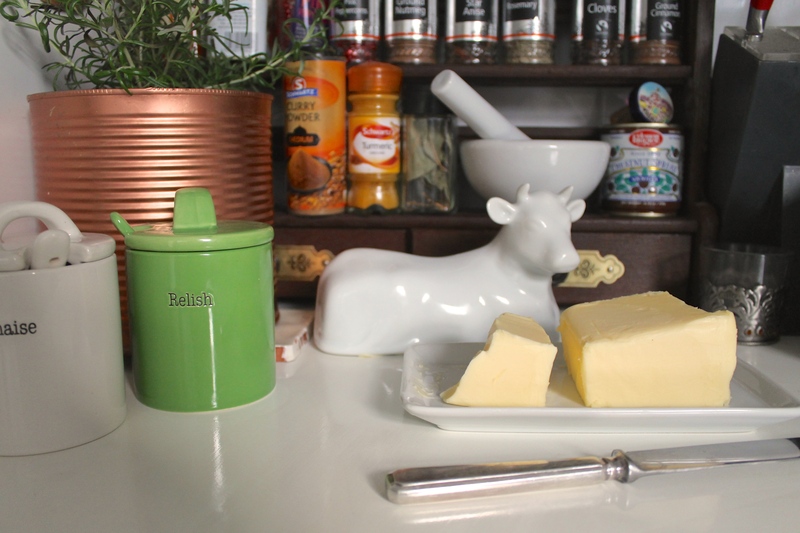 I’ve wanted a cow butter dish for years, and now we’re only using real butter rather than marg, it’s great to be able to keep this little fella out on the side, ensuring my butter’s always spreadable. 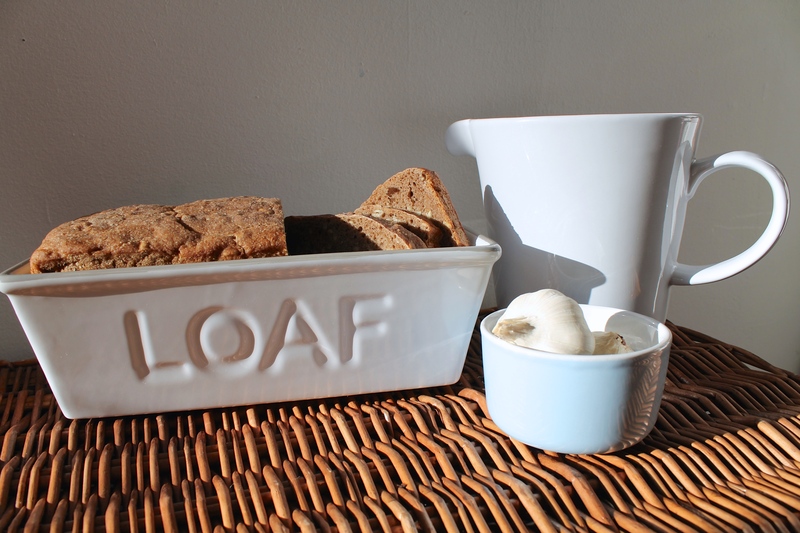 And I’m hoping to try making a paleo inside-out loaf in this gorgeous ceramic loaf pan soon, though I’m equally tempted to just fill it with succulents for a pretty display. The ceramic bottle has been used to store my homemade almond milk when not in use to display blooms (cue further smug face), and we’ve also been making our own pesto from (what else?) kale, which keeps brilliantly in this little relish jar. 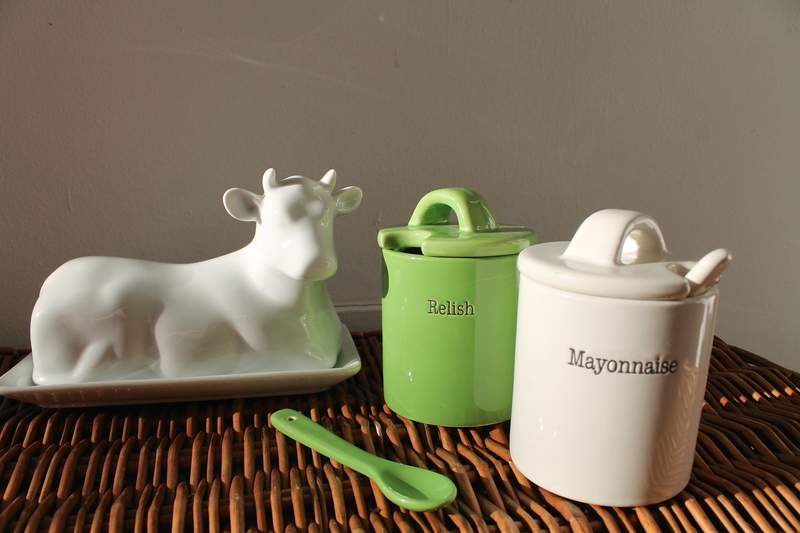 I’m planning to make my own mayo too once our previous shop-bought number has run out, so my ceramic mayonnaise jar is currently waiting patiently for a fill-up. It’s possibly a little premature to be gathering up kitchen bits before we’ve even started work on our planned kitchen makeover, but with all the decs down, the house feels somewhat bare and empty (cue laughter from boyfriend at the many trinkets and baubles still cluttering every surface) and there is something so delightful about simple white ceramics. A visual palette-cleanser, if you will. Anyway, fear not, I won’t start boring you with my Kale Tales and it’ll be back to interiors-chat next week, though hopefully I’ll be able to share more shots of these new homeware additions in my new kitchen space before too long!